I am vivid reader and consumer of articles about productivity, achieving more and using this limited time we are left with in most efficient way. From testing various mobile and desktop applications, selecting particular part of the day for certain task type up to different techniques (like Pomodoro) — tried them all. And ashamed to admit, one obvious, easy to find and easy to apply feature, sat there on my desktop / laptop computers quietly, waiting to be discovered. Or, what Windows + Tab keyboard combination does? Same here — I stumbled on that completely by chance, trying to switch windows with Alt + Tab. Curious as I am, immediately asked Google what is that. In turned out that it is deadly simple, highly effective and does something every one of us is trying — reducing noise and enabling you in this chaotic world to concentrate on one thing and to do it right. And not even new feature 🙂 – first version was build by Xerox PARC in 1980s (!!!) and implemented for Windows 3.x as Rooms for Windows. 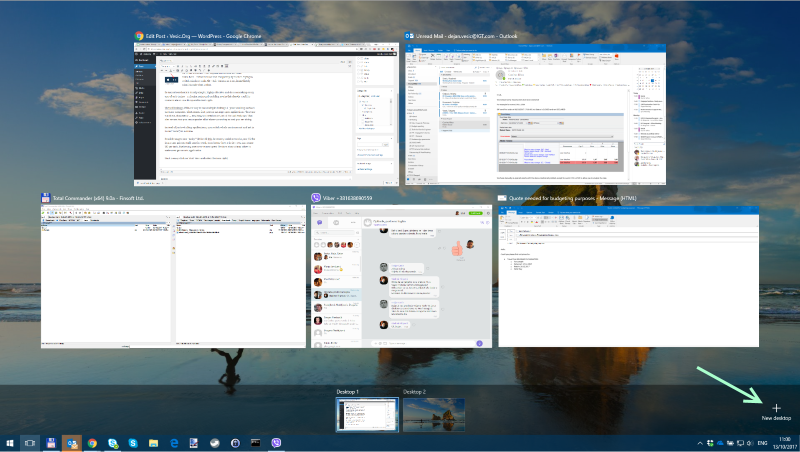 Virtual Desktops (VD) are way to run multiple desktops (= your working surface) on same computer. That means that you can arrange open applications / browser windows, documents … anything you need on any set of Virtual Desktops. That also means that you can organize all of above according to task you are doing. Instead of just switching applications, you switch whole environment and get in focus (“zone”) in no time. Possible usages: one “noisy” VD for all IMs, browsers, social networks, one VD for important private stuff, one for work; even better (how I do it) — you can create VD per task, like having one to write next great Medium story 🙂 and other to write next great web application. Finally, you can fine tune Settings for this in Settings / Multitasking – most important part is which applications will appear on task bar – only for active Virtual Desktop or all active applications. One of rather frequent tasks is import of existing contacts from other sources into newly created Gmail account. There are lot of tools (Gmail offer that as well) for two-way synhronization between various applications (Outlook and such), but one time, one way (Desktop -> Gmail) is not covered very well. 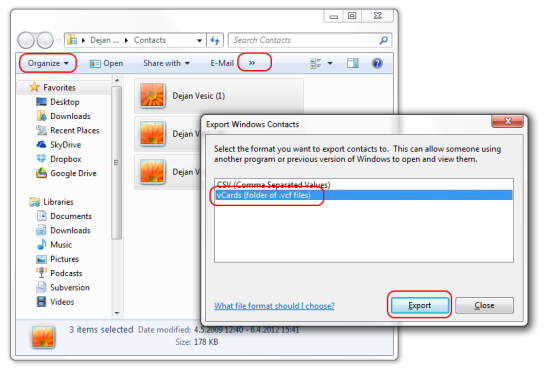 So, task is simple: import multiple VCF (vCard) contacts into Gmail contacts. 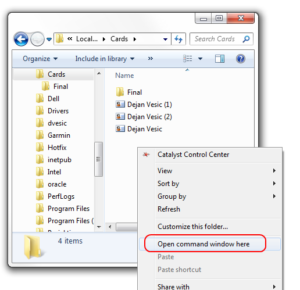 I will use Windows Contacts as an example inside Windows 7 (Nokia PC Suite can synhronize contacts in your phone with Windows Contacts) but procedure can be applied to any set of *.vcf files. Let’s assume that you created new folder Cards on C: drive and exported *.vcf there. 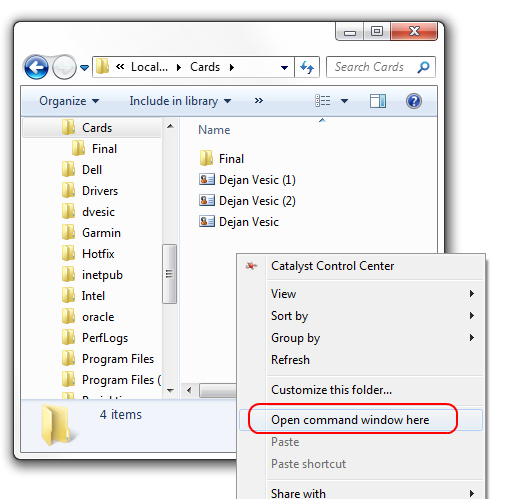 Also, create another subfolder of Cards folder – Final. Next step is to combine all *.vcf files into one big file. You can close command windows after this. If you are English speaking person and have no strange characters in names of your contacts, you can stop here – use C:CardsFinalBig.vcf as source of import in Gmail Contacts and you are fine. However, most of us non-English speaking should do final step: proper conversion of file. We will use Powershell for this final step. get-content "Big.Vcf" | out-file -encoding "UTF8" -filepath "ConvertedBig.Vcf"
Oracle is rather slow when it comes to releasing Oracle Client software for new Microsoft Operating Systems. So, I did not expect that Oracle Client for Windows 7 will be ready (and it is not) in time when Windows 7 RTM is released. Download from MetaLink Oracle Database 10g Release 2 Patch Set 3 and unpack. For points (3) – (5) you have to have MetaLink account – I was unable to locate 10.2.0.4 Patch Set anywhere else. 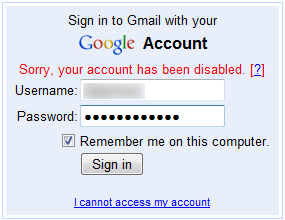 This is drawback, and you can try using 10.2.0.3 if you do not have MetaLink account. Of course, this is just workaround until Oracle releases proper Windows 7 client. Personally, I am not too big fan of iPhone, especially regarding earlier versions. Than again, as a honest technology geek, I also must admit that iPhone 3GS set high standards both in arena of mobile devices as well as in arena of PDA and general mobile platforms; operating system is way better, development support (SDK, tools) gives you opportunity to create stunning applications, and on top of that, iPhone store can give necessary head start and much needed customer and community support. 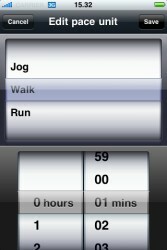 I am not talking this “from thin air” but from second hand experience, closely watching development of one great little iPhone application – Run Mate, by my friend and colleague, Aleksandar Vacić. 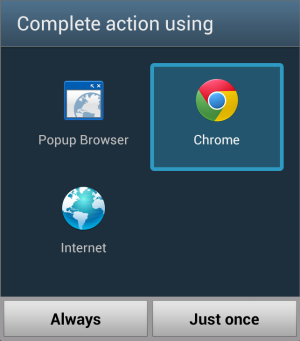 Beautifully crafted, both from technical and design side, small, fast and (on top of everything else) very useful – Run Mate is real example how one mobile application should look like: it should follow all the standards of the underlying ecosystem (operating system), giving to end user maximum benefit for really, really affordable price. In one of the projects at my work, I got task to verify some data (in migration process from old system to new one); one of the fields was Chilean RUT (Rol Único Tributario) or Tax Identification Number. If the original control char (9th char) is equal to calculated control char, RUT is valid. One of important aspects when I am selecting hosting provider is subversion support. My previous host provider, DreamHost, had it, as well as my current host, Mediatemple (I am using (gs) – Grid Service option). However, while DreamHost was allowing access to subversion repository over http protocol, Mediatemple is more strict: it requires to use svn+ssh (svn protocol over ssh). It proved that setting up this kind of access using great Windows subversion client, TortoiseSVN is a bit of a pain. So, here is what helped me to get that done. In order to access your subversion repository over ssh, you need to create pair of keys: private and public key which will be used for authentication of access to repository. Public key should be stored on your host account, while private key is your own and you should take great care not to give access to private key to anyone else. Your identification has been saved in /home/12345/users/.home/.ssh/id_dsa. Your public key has been saved in /home/12345/users/.home/.ssh/id_dsa.pub. Step 3. above has multiple implications to the rest of the process; if you select to have passphrase to protect your private key, you will need to enter that passphrase at least when logging in computer, in order to “unlock” your private key. If you decide not to have passphrase, you won’t need to use Pageant or any other method for managing key. However, this is basically as having heavy iron doors w/o lock. I strongly suggest to assign strong passphrase to your key. When prompted, enter ONLY your username ( serveradmin@yourdomain.com ) – you should be logged on Mediatemple server WITHOUT need to enter password. If that is not true, some of the steps above were missed – check above. Why TortoisePlink when we were talking about PuTTY all the time? Well, TortoisePlink is just custom version of PuTTY, and it is part of TortoiseSVN and all above can be applied to it. You should be asked (twice) for your passphrase, and after short time, presented with your svn repository on Mediatemple. Solution to this is another PuTTY application – Pageant – SSH authentication agent; it holds your private keys in memory, already decoded, so that you can use them often without needing to type a passphrase. In that case, you would be asked just once when you log on for passphrase. In a recent ASP.NET project, we had to replace NLog (excellent logging .Net library, by the way) assembly with newer one. In a first attempt, it did not work 🙁 – assembly redirection did not happen. Even Fusion Viewer could not find anything strange – it looked like whole redirection part was simply ignored. all worked as a charm. It turns out, that due bug in Visual Studio 2005, if you used in some point the built-in web administration tool (launched via the WebSite->ASP.NET Configuration menu item) it will add this name space to root configuration element. This will cause not just to stop Intellisense working for Web.Config but also will ignore any Assembly Binding redirection instructions. I am a big fan of Google – I like services it offers, as well as Google “attitude” toward outside world. Once when you start using those services, and transfer most of your digital life online, you are hooked – possibility to access/create all of data from anywhere and virtually from any device which interprets html (and that means your mobile phone) is something that you will appreciate much. For no apparent reason (one night I was sending my mail and next morning I was presented with dreadful message) I got “Sorry, your account has been disabled”. This is not just access to mail, but to Google Docs, Google Notebook, Google Reader, Google Bookmarks – just to mention ones that I use most often. Also, disruptive and unannounced access restriction to the same online repository can hurt you a lot. Add on top of that very slow response of Google Support (third day, and I have two automated responses and one form filling) and no idea when or even if I would get access to my account again – that put serious doubts in my decision to give trust to Google as big and “good” firm with my data. Google is not nice; Google is just another company in search for steady and infinite revenue streams; all “free” services it offers are just way to expand market where ads (as main source of revenue) can be placed. As soon as my account is enabled, I will change two things right away – change/add new online “office” provider (I am testing Zoho now) and backup all of the stuff regularly to desktop (good old offline storage) – my data and time invested to create them is of utmost importance. Update: they enabled my account after four days; as expected, no explanation was given why account was suspended in a first place. Not nice – 4 days in speedy and busy everyday life w/o mail and many of documents and notes is at least “not nice”. Maybe all those services are free, but I would rather pay some amount for benefit of having telephone support around of clock. Problems with Microsoft Jet OLEDB on 64bit Windows? not registered on the local machine. Check if your application is setup for any CPU (Properties / Build / Platform target) which is default. If that is the case, change it to x86 – at the moment, there are no 64bit drivers for Microsoft Office, so only 32bit applications will work as expected. Posted on 24. June 2008. 24. May 2016. Author Dejan VesićCategories .Net, Blog-eng, Database, MicrosoftLeave a comment on Problems with Microsoft Jet OLEDB on 64bit Windows?